NEO Price Analysis: Will NEO/USD Supports Hold To Return Gaining? NEO price has dropped below the $30.00 level a couple times the last days. Now NEO/USD is returning slowly but steady upwards with hope that supports will act on their purpose. 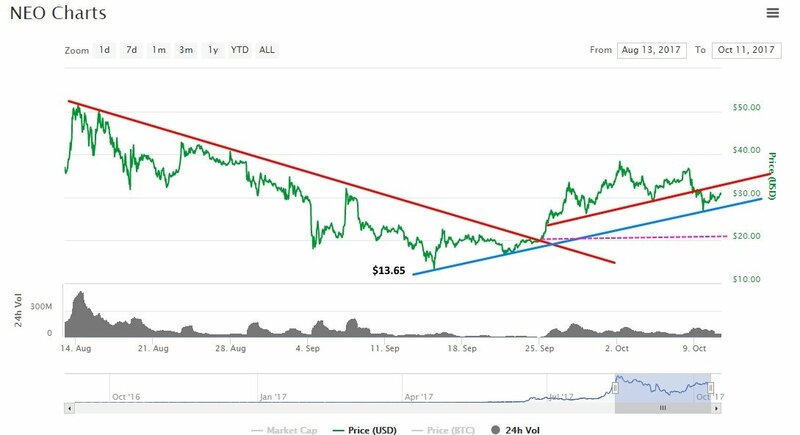 The end of September and beginning of October marked a very positive turn for the NEO token holders as the price broke out of the declining trend since its record all-time high that lead to a low of $13.65. On Sep 26, the pair successfully closed above the bearish trend at $20.40 that signaled bulls to wake up and return on the market. The particular return and recovery phase led the price to a high that was formed above $38.00 but met sellers that tanked the development from retesting the major $40.00 any time soon. On Oct 8, the trend line that was acting as a support approx at $32.08 was cleared downward and the value dropped below to a low of $26.93. 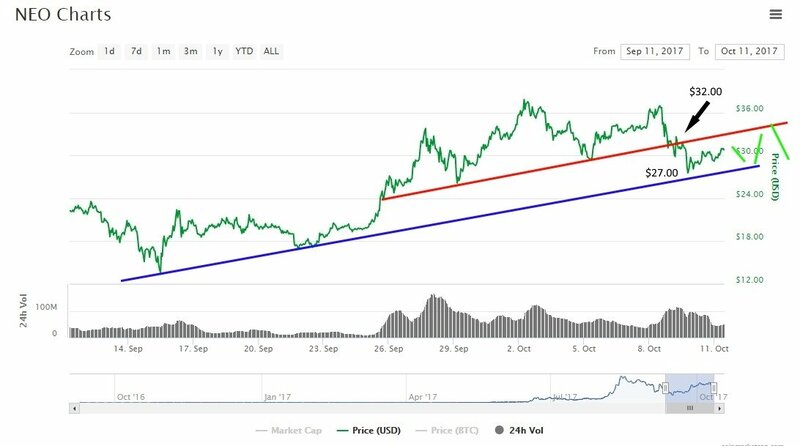 Remember that support because in the near term it will play a key point for more value increase. As long as the price is in the middle of the two ‘border lines’ it is not recommended to put any trade on the cryptocurrency. Wait for a break below the $30.00 level for any buying opportunity, or if it breaks above the $32.50 – $34.00 and lastly which will lead to $36.40. Right now the price is trading at $30.80 with 3.59% increase in the last 24-hours. Market capitalization is growing and returning everyday at $1.5 billion with Bittrex and Binance leading on trading volume – around $16 million. 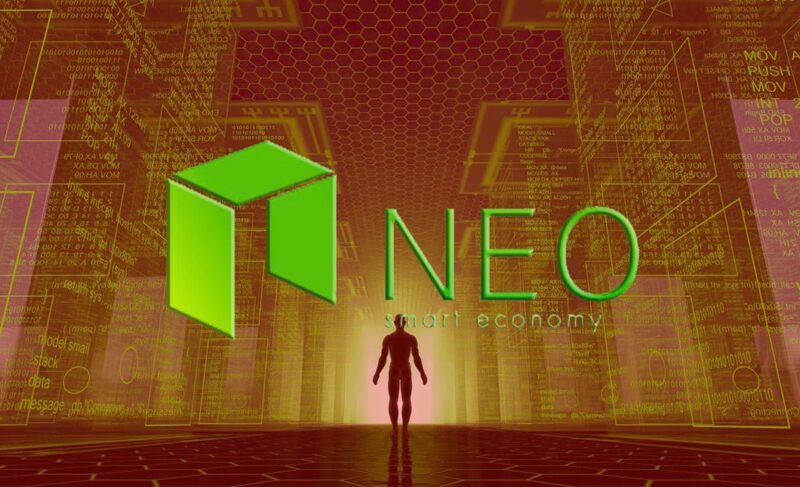 On the longer term – any project or development that is based on the NEO blockchain platform will be pushing upwards the price and community confidence. The second NEO ICO will be released in a very short time that will be a P2P trading dApp built by Aphelion. Bitcoin Price Analysis: Can BTC/USD Surpass $4900?